These two-day training courses are for patient and public voice partners involved in NHS England or supporting transformation programmes on a regular basis. The course aims to support PPV partners to gain a clear understanding of their roles and responsibilities in order to effectively contribute to improving NHS England services. Through the course we will explore how you can effectively work in partnership with a range of stakeholders to influence change and develop your skills and confidence – making the most of your role. “In my role of established MVP chair and LMS board service user representative; I attended the NHS England PPV Partners training in March 2018. Although it was a big step out of my comfort zone, I am very pleased I went and would recommend it to both new and experienced MVP chairs and reps. The course is well facilitated by Wendy and Helen who cover a range of topics over the two days, using different learning styles and levels of involvement to keep it interesting and engaging for everyone. Some sections are fairly brief, but plenty of background/further reading is available for more in-depth information. I was pleased to meet members of the NHS Patient Participation Team, led by Gillian Fletcher, who also attended. They are very keen to support MVPs and hugely enthusiastic about their work ensuring the voice of NHS service users is heard and NHS services are co-produced. As well as the knowledge and skills I gained, it was a great networking opportunity: I met people from all over the country in similar roles to ours within different parts in the NHS. I found it equally assuring and disappointing that they are facing similar challenges to patient involvement in other services and useful to hear how they have overcome the hurdles. Everyone was keen to hear about the amazing work of MVPs around the country and found our networking, support structure and shared learning inspirational. Places are available on the Understanding the Health and Social Care Environment (UHSCE) online training course, which is accredited by Certa. The course is divided into three sections: about the stakeholders, about tools and methods for influencing health and social care, and about how you can present your community issues to have maximum impact for positive change. There are two rounds of the course starting on 04 September 2018 and 06 November 2018. The course ends with a full day of assessed presentations accordingly on 27 November 2018 (for the course starting on 04 September) and on 5 February 2019 (for the course starting on 06 November). The final day gives participants an opportunity to share their projects they have been working on as part of the course, gather practical advice on how to develop their work further, and to network. The training received excellent feedback from volunteers who participated in previous cohorts. Take a look at the course advert (110KB PDF) outlining what the course will cover and application form (875KB PDF). For more information about the course and how to apply please email: england.ppve-learning@nhs.net or lisa.ramsey1@nhs.net. There is further information on learning and development and learning for patients and the public (accredited courses) from NHS England. On the 70th birthday of the NHS, a message from Lisa Ramsey, Service User Voice Policy Manager for the Maternity Transformation Programme at NHS England, who works closely with our national committee on supporting Maternity Voices Partnerships. “It’s Thursday 5th July and today marks the 70th birthday of the NHS. We all see improvements that could be made to the NHS, but today is all about celebrating all that is great about the National Health Service. We are celebrating the mere fact it exists. Having an NHS means when your child has fallen and bumped their head you have 111 to call for advice, when you need help in an emergency you can head to A&E and when you have something you need to see a GP about you can. The NHS is all of ours to use as sparingly as we can. How fortunate that #NHS70 is falling mid-way through a 5 year maternity transformation programme. 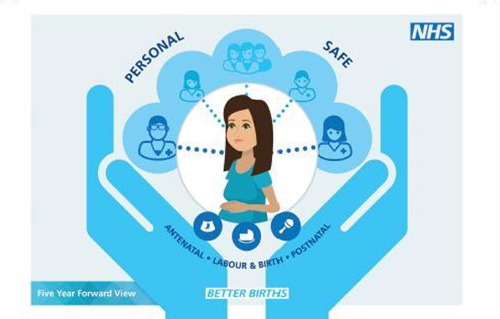 Maternity care is being transformed across England to become kinder, safer and more personalised. That means looking after maternity staff well and ensuring they train together and work well together. It also means ensuring every woman has the opportunity to know and trust her midwife and see the same midwife throughout her maternity journey. It means families are prioritised, not just women or babies and everyone’s mental and emotional health are important as well as physical health. It means the experience of being pregnant, giving birth in the place you choose and feeding and caring for a new baby is as important as health. National Maternity Voices (NMV) are delighted to be part of the Better Births Two Years on event this Tuesday (27th March 2018) at The Midland hotel Manchester. Come and find us at the ‘Market Place’ which is running over lunch between 13:00 and 14:15 in the Octagon lounge and Trafford suite. 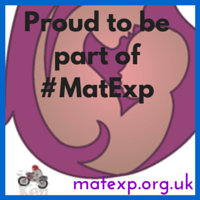 Look out for our pop-up banner and come and say hello if you want to find out more about how Maternity Voices Partnerships (MVPs) can and should be at the heart of Better Births! We will also be holding a series of pop up talks during lunch in the Midland lounge. NMV committee members Cathy Brewster and Emma Crookes will be talking about what newly formed Maternity Voices Partnerships (MVPs) need to get going at 13:45-13:55 followed by Sandra Guise and Laura James discussing what established MVPs can achieve at 14:00-14:10. 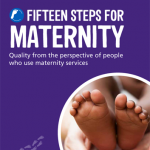 The Better Births 2 years on event will also see the launch of the 15 Steps Challenge for Maternity developed by Lisa Ramsey of NMV in her role as Service User Voice Policy Manager for Maternity at NHS England. 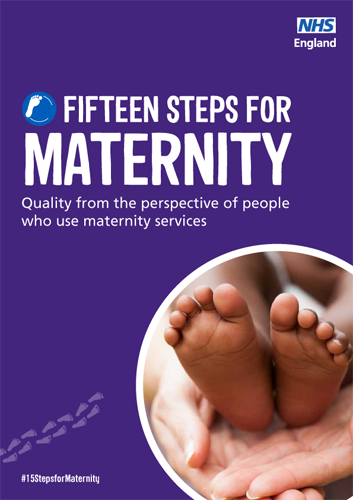 The Fifteen Steps for Maternity toolkit is designed especially for use by Maternity Voices Partnerships (MVPs). These local teams of service users, midwives, doctors and commissioners can use the toolkit to enhance collaborative working so that together improvements to maternity services can be identified and delivered.